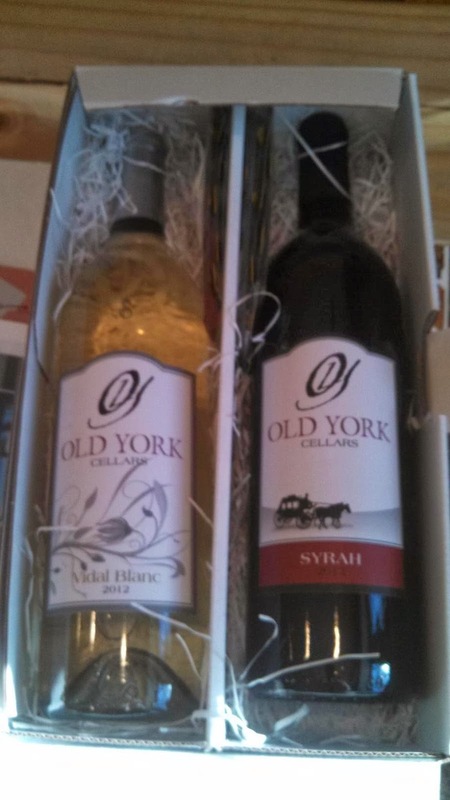 Last night Old York Cellars hosted their January edition of the Virtual Wines online tasting where consumers can watch and/or participate in a tasting of two wines from one New Jersey's oldest wineries. The winery encourages consumers to participate at the winery, by hosting their own tasting party, or follow along via the Virtual Wines Livestream site, Facebook, or Twitter. For me, I was fortunate to receive a complimentary sample. The tasting was hosted by winemaker Scott Gares and sommelier Laurin Dorman and featured two wines: the 2012 Vidal Blanc ($15) and Syrah ($18). And quite frankly, these were the two tastiest wines I've tried from the winery. This webcast started with a discussion on the cold hardiness of Vidal - particularly its use in ice wines or late harvest styles; I learned that it is even grown in Sweden as an ice wine. But the Old York Cellars 2012 Vidal is bone dry - zero R.S.. On the nose and palette it displays a Sauvignon Blanc character of lemon citrus, followed by a nice refreshing acidic finish. Always enjoy sampling this French-American hybrid and this wine shows Vidal is enjoyable dry just as much as semi or sweet. Dorman suggests several food pairings with the Vidal which include goat cheese, triple creme, brie, feta, risotto, shellfish, pasta with cream, poultry, and Greek or Caesar salads. The Syrah was made from 50% estate grown fruit, maturated on skins for 20 days and then treated in medium oak. The finished wine starts with a dark cherry almost black berry nose followed by a nice balance of dark cherry flavor and a tasty peppery spice that lingers in the finish. This finish is also soft - just enough tannins to maintain a chewy affect, but not enough to overshadow the delicious flavor. This is an old world styled wine; very impressed - nicely done. Dorman's food pairings include Gruyere and smoke cheddar, beef stew, brisket, grilled lamb, London broil, sausages, and salmon. And it wouldn't be a Virtual Wines tasting without Laurie's Chocolates -Madagascar Single Origin 65% and Hawaii Single Origin Milk Chocolate with Macadamia & Sea Salt. The latter was paired with the Vidal so that the wine's acids mingle with the chocolate's milk fat. The darker Madagascar chocolate was paired with the Syrah, adding a litter bitterness to the fruit and pepper flavors. Like I wrote previously, these were the two tastiest wines I've tried from the winery. I hope to be included in the May addition as they introduce their SF Competition Gold winning 2012 Merlot. Cheers.